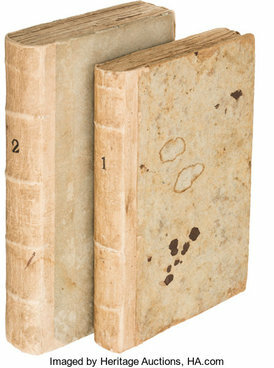 Dallas, TX - An important piece of American history will be offered when a rare copy of The Federalist: A Collection of Essays, Written in Favour of the New Constitution still in its original publisher’s boards crosses the block in Heritage Auctions’ Rare Books Auction March 6 in New York. The board bindings were meant to be temporary, and purchasers of books in the 18th century would have their binders trim the edges and then rebind the book in calf, so a copy in this configuration is an undeniable rarity. The books, with a pre-auction estimate of $75,000+, originally were published in New York newspapers under the pseudonym, “Publius,” and without the authors’ names in this first collected edition. But the real names of the authors - Alexander Hamilton, James Madison and John Jay - are hand-written on the title page.